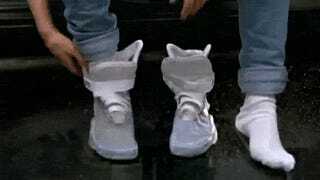 Dear Nike, When Can We Expect Those Shoes From Back to the Future II? Back in January, Nike announced that it would release the self-lacing shoes from Back to the Future Part II by the end of the year. Well, it’s August already, and we’d just like to kindly remind Nike that the clock is ticking. No pressure. Yes, the 1989 movie Back to the Future Part II included dozens of technologies that we’re still waiting on. Including pizza rehydrators, weather control, and the hoverboard (sorry nerds, but that Lexus hoverboard was just a publicity stunt using existing tech). But you know what might help relieve our disappointment that the year 2015 isn’t quite as cool as we were promised? Those powerlace shoes. I recently reached out to Nike to ask them if the shoes are still on track for a 2015 release and haven’t heard back. So consider this my open letter. Pretty please? Sure, we could go buy the low-tech knock-offs. But we really want to give you our money. We’re not even going to get greedy and ask that they’re out in time for the BTTF trilogy’s re-release in theaters this October, though that would be really great of you. By Christmas will be just fine. Again, no pressure at all.